Thought I’d quickly blog her show before the next one begins, there’s some good ones today , I can’t wait for Zayan The Label! 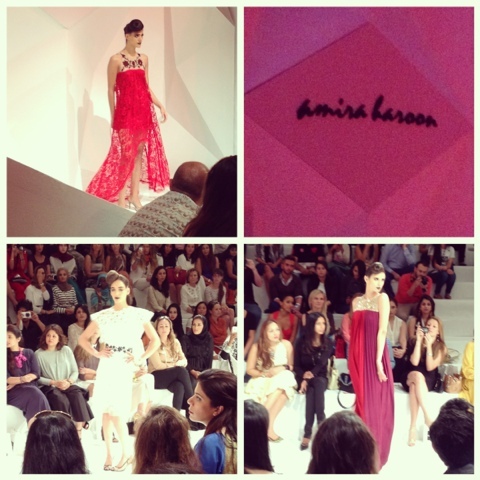 Amira Haroon’s opening piece was beautiful , A silky jumpsuit that dropped like a kaftan in two shades of red and embellished around the neck and back. Almost every other piece was made of lace which isn’t surprising for Amira who’s muse is to produce clothes with a story to tell, to be inspired by Alice in Wonderland type characters choosing to wear fiercely feminine pieces. Her floor length lace gowns were simple but beautiful, her style stems from the cut and the fabrics.